Two graduate students with the Scripps Environmental Accumulation of Plastic Expedition, or SEAPLEX, found evidence of plastic waste in more than nine percent of the stomachs of fish collected during their voyage to the North Pacific Subtropical Gyre. Based on their evidence, authors Peter Davison and Rebecca Asch estimate that fish in the intermediate ocean depths of the North Pacific ingest plastic at a rate of roughly 12,000- to 24,000 tons per year. 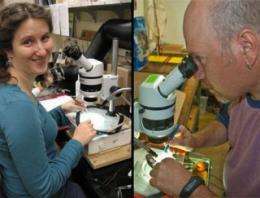 During the SEAPLEX voyage in August 2009, a team of Scripps graduate students traveled more than 1,000 miles west of California to the eastern sector of the North Pacific Subtropical Gyre aboard the Scripps research vessel New Horizon. Over 20 days the students, New Horizon crew and expedition volunteers conducted comprehensive and rigorous scientific sampling at numerous locations. They collected fish specimens, water samples and marine debris at depths ranging from the sea surface to thousands of feet depth (See SEAPLEX Oceanographic Equipment). Of the 141 fishes spanning 27 species dissected in the study, Davison and Asch found that 9.2 percent of the stomach contents of mid-water fishes contained plastic debris, primarily broken-down bits smaller than a human fingernail. The researchers say the majority of the stomach plastic pieces were so small their origin could not be determined. "About nine percent of examined fishes contained plastic in their stomach. That is an underestimate of the true ingestion rate because a fish may regurgitate or pass a plastic item, or even die from eating it. We didn't measure those rates, so our nine percent figure is too low by an unknown amount," said Davison. The authors say previous studies on fish and plastic ingestion may have included so-called "net-feeding" biases. Net feeding can lead to artificially high cases of plastic ingestion by fishes while they are confined in a net with a high concentration of plastic debris. The Scripps study's results were designed to avoid such bias. The highest concentrations of plastic were retrieved by a surface collecting device called a "manta net," which sampled for only 15 minutes at a time. 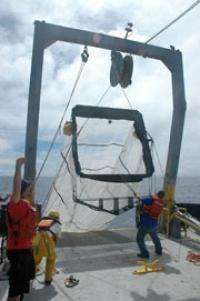 The short sampling time minimizes the risk of net feeding by preventing large concentrations of plastic from building up, and also by reducing the amount of time that a captured fish spends in the net. In addition to the manta net, the fishes were also collected with other nets that sample deeper in the water column where there is less plastic to be ingested through net feeding. The new study focused on the prevalence of plastic ingestion, but effects such as toxicological impacts on fish and composition of the plastic were outside of the study's goals. The majority of fish examined in the study were myctophids, commonly called lanternfish because of their luminescent tissue. Lanternfishes are hypothesized to use luminescence for several purposes, including counter-illumination (thwarts predators attempting to silhouette the lanternfish against sunlight), mate attraction and identification and illumination of prey. Such fish generally inhabit the 200- to 1,000-meter (650- to 3,280-foot) depth during the day and swim to the surface at night. "These fish have an important role in the food chain because they connect plankton at the base of the food chain with higher levels. We have estimated the incidence at which plastic is entering the food chain and I think there are potential impacts, but what those impacts are will take more research," said Asch. Rather than a visible "patch" or "island" of trash, marine debris is highly dispersed across thousands of miles of the North Pacific Subtropical Gyre. The debris area cannot be mapped from air or space, so SEAPLEX researchers collected samples in 132 net tows (130 of which contained plastic) across a distance of more than 2,375 kilometers (1,700 miles) in an attempt to find the boundaries of the patch. The region, a "convergence zone" where floating debris in water congregates, is generally avoided by mariners due to its calm winds and mild currents. The North Pacific Subtropical Gyre has been understudied by scientists, leaving many open questions about marine debris in the area and its long-term effects on the marine environment. "This study clearly emphasizes the importance of directly sampling in the environment where the impacts may be occurring," said James Leichter, a Scripps associate professor of biological oceanography who participated in the SEAPLEX expedition but was not an author of the new paper. "We are seeing that most of our prior predictions and expectations about potential impacts have been based on speculation rather than evidence and in many cases we have in fact underestimated the magnitude of effects. SEAPLEX also clearly illustrates how relatively small amounts of funding directed for novel field sampling and work in remote places can vastly increase our knowledge and understanding of environmental problems." Yes. Production of throw-away plastic is a major problem. Unfortunately, environmentalism has almost been completed discredited by promoters of junk science, like AGW, by snake-oil salesmen and scientists that are greedy for government grant funds.